Need more online revenue? Frustrated that you’re bypassed by the largest national ad networks? 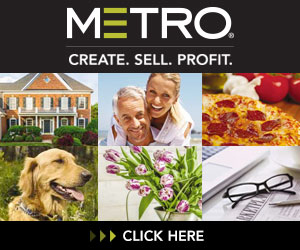 Metro Creative Graphics, Inc. is a leading provider of advertising, creative and editorial resources designed to help media companies make money with their print, Web and m obile products. With an unparalleled dedication to providing the finest resources available for ready-to-use images, spec ads, ideas, stock-quality photos, logos/trademarks, auto manufacturer photos, marketing/sales materials, copyright-free editorial features, print templated sections, state-of-the-art online e-Sections, and groundbreaking digital ad development tools—plus custom image, ad design and editorial services—Metro remains unmatched in serving the creative needs of today’s media companies.